Though largely overshadowed by Malibu and Santa Barbara, her sister cities to the south and north respectively, Ventura offers big city arts and small town charm. There's a burgeoning wine and culinary scene, a hip downtown threaded into the bay of a popular surf spot and the sort of mellow beach town vibe that harkens back to California of old. Located along U.S. Route 101 midway between those bookend show towns, Ventura is still relatively unexploited, a coastal escape just an hour's drive from the dream factory of L.A. To be sure, this classic California beach burg and its environs feel worlds removed. Named for the eighteenth-century Mission San Buenaventura, the city of just over 100,000 inhabitants is home to working-class folk, farmers, fishermen and surfers. A number of wealthy Hollywood celebs and musical icons live here, too, having opted for a low-profile existence in the hills and along the coast. Thanks to an increasing number of tourists who come to enjoy the ocean and the Channel Islands just offshore, Ventura now buzzes with a revitalized historic downtown full of shops, restaurants, wine and coffee bars, and a vibrant arts scene including galleries and museums. Ventura's weather is more intemperate than most places in Southern California; indeed, with its near-daily ocean winds and relatively large waves, it often resembles the rugged northern coast. If what the locals refer to as "June gloom" (foggy morning weather) appears on the coast, you can head fifteen miles inland instead to sunny Ojai, in search of its renowned "pink moment" — a magically lit sunset that bathes the Topa Topa Mountains and east to west running valley in a rosy glow. Ojai, which means "nest" in the native Chumash language, is a tranquil spot known for its small-town atmosphere, an enchanted place where orange blossoms perfume the air and spiritual communion at Meditation Mount is as popular as the golf course at the majestic Ojai Valley Inn & Spa. Combining Ventura and Ojai for a three-day getaway offers something for everyone, including beach-bound families, couples looking for a romantic escape, girlfriends with a penchant for shopping or spas, surfers and even solo travelers seeking spiritual enlightenment. Should you decide to base your visit in Ventura, the craftsman-style Pierpont Inn & Racquet Club offers a central location and a bit of history. Freeway noise is an issue, however, and the 1910 property built to accommodate auto enthusiasts is not as grand as it was. At Ventura's only beachfront high-rise hotel, the Crowne Plaza Ventura Beach, guests can practically roll out of bed and check out the popular surf and kiteboarding scene at "The Point." The protected inside bay, known as "C-Street" (named for nearby California Street), is popular with surfers, while kiteboarders congregate at the more exposed western tip of the point. The Clocktower Inn and the Bella Maggiore Inn, both located in the heart of downtown, are within walking distance of Main Street. 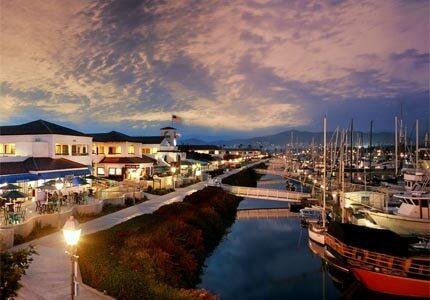 The Four Points by Sheraton Ventura Harbor in the Ventura Harbor area overlooking the marina is another option. Bed-and-breakfast choices even include a converted Gothic church: The Victorian Rose Bed & Breakfast. It's worth spending a night or two in Ojai, even if it means extending your stay. The Ojai Valley Inn & Spa, a top-of-the-line retreat noted for its golf course and luxurious Moroccan-style spa, is a destination unto itself. Guests looking for funkier accommodations can book a stay at The Emerald Iguana Inn, or its equally groovy sister The Blue Iguana Inn, both of which offer unique, charming lodgings with an artistic bent and rooms showcasing the work of local artists and craftsmen. For a relaxing and enchanted stay, check into The Lavender Inn, a B&B with a large lawn on which to lounge. Sprigs of lavender decorate the rooms of this 1874 building, Ojai's first schoolhouse. Breakfasts here showcase local ingredients, many of which you'll find every Sunday morning at the farmers market, located just a few steps east of the Inn. Those who value physical fitness can check in to The Oaks at Ojai, in the heart of downtown, where since the 19070s the focus has been on healthy weight loss and wellness. Begin your visit in Ventura. Tucked between two seasonally flowing rivers and situated between the California coastal range and the Pacific, the city's downtown and waterfront areas offer many diversions. If you're not interested in breakfast at one of the hotel restaurants visit The Cajun Kitchen for traditional American breakfast as well as southern-influenced specialties like gumbo omelets and blackened redfish with eggs. Locals congregate over coffee at Palermo, and then venture east on Main Street into Midtown where Allison's Country Cafe and Pete's Breakfast House are favored for down home dishes like fluffy biscuits and homemade hash. Plenty of unique items are for sale at reasonable prices in the downtown section of walker-friendly Main Street. The area's lack of chain stores is refreshing, and adds to the town's distinct character. Treasure hunt in the numerous thrift stores, antique shops, trendy clothing boutiques, gift shops and home furnishing stores. For mod décor, don't miss Fusion Home. The Iron & Resin Garage offers a unique showcase of Ventura-style surf meets blue-collar Americana clothing and goods. Main Street also offers cultural diversions including numerous art galleries showcasing Ventura's lively artistic community. Parking meters are new to downtown, but there's still plenty of free parking nearby in city lots and on side streets. Main Street and its environs are also a veritable restaurant row. Whether you want healthy wraps at Nature's Grill & Juice Bar or fish and chips at Anacapa Brewing Company, lunch is within a stone's throw. Downtown, you'll find a trio of Thai restaurants within the same number of blocks; the best of the three is Rice. In a mundane strip mall at the bottom of Main Street, Gourmet Oriental offers Chinese food that far exceeds its location. Its new neighbor, Himalaya, also hits the mark with quality Tibetan and Nepali food. Don't miss the Museum of Ventura County, which underwent a major renovation and expansion, reopening in the fall of 2010. Permanent displays showcase the mission and rancho periods, citrus and oil industries in Ventura County, suburban growth and even vintage surfboards. Changing exhibitions of works by regional artists with international reputations, including Otto Heino, John Nava and John C. Lewis, are exceptional. Noteworthy are the George Stuart Historical Figures, a rotating exhibit from the museum's permanent collection of 200 figurines depicting famous and infamous people through the ages. From the dagger in Jack the Ripper's grasp to the crown jewels in Queen Victoria's tiara, the detail is remarkable. The Red Brick Gallery downtown is worth a visit, too, for local art. And further up Main Street, in Midtown, the relatively new Sylvia White Gallery offers the contemporary polish and big name artists of a major metropolis. Settle down with a drink before dinner at Café Fiore, a popular bar and Italian restaurant, or at one of the many downtown wine bars, which usually feature local musicians playing live music and/or local artists' works on the walls. If you're in the mood for Italian, we suggest a quick departure from downtown into the Seaward Avenue Beach District. Here, Spasso Cucina Italiana serves lovely Roman fare just steps from the sand. Nightlife, especially on the weekends, is alive and well and ranges from productions at the acclaimed Rubicon Theatre to rock concerts and visiting acts at the Ventura Theater. Dargan's Irish Pub & Restaurant, an Irish watering hole with pub fare, provides garrulous entertainment.